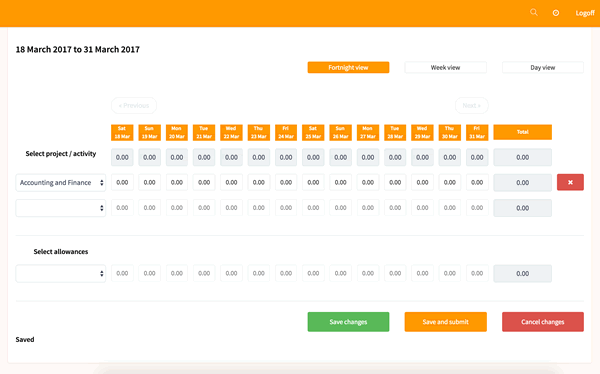 Timesheets that work with integrated leave, allowances, entitlements and other smarts as standard. Enable your staff time to spend their time on their jobs and not shuffling paper. Intuitive timesheets with no training required for most users. Customise your work-flows for approval including reminders and processing cut off times. Allow staff with multiple roles and pay types to complete single timesheets. Link staff to projects, entitlements, leave, allowances and pay types to ensure timesheets do the work so you can concentrate on making sure people get paid on time. Less incorrect entries, messy writing, non-relevant project codes and non-submitted timesheets. Check current and future timesheets for all staff and run reports that make sense. Transfer responsibilities for approvals between staff using higher and additional duties functionality. Configure buffer and rounding rules on real time tracking to ensure entitlements are calculated fairly and aligned with policy. 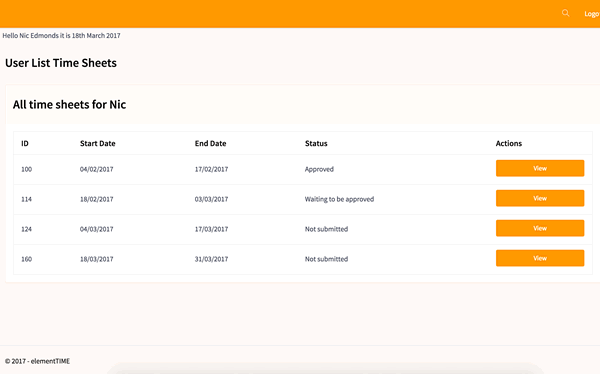 Check work-flows, override approvals and keep an eye on progress with payrun status. 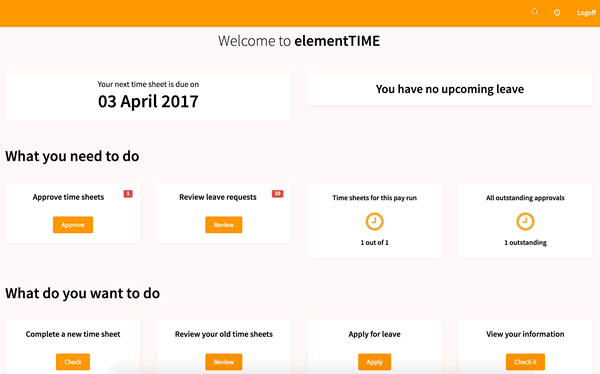 elementTIME keeps balances current and updates timesheets with leave automatically. Nice right? Delegate responsibility for timesheet approval right down to an individual staff level so supervisors can supervise even if they are not direct managers. Clear defined workflow lets you know who has submitted timesheets and who needs to. Make adjustments and edits before approving for payroll. See timesheets current and historic for all direct reports. Keep an eye on TOIL and other liabilities so you can proactively manage leave balances for your team. Enter time from any device. Record in real time or retrospectively. Leave is automatically added to your timesheet once approved. See all your timesheets current and historical.